The White Oak distillery is perhaps the least known of Japan’s whisky producers, but it has a legitimate claim to be the country’s oldest with a license to make whisky granted in 1919 - four years before Yamazaki was built. It's located in the city of Akashi in Hyogo Prefecture, west of Kobe, facing the Seto Inland Sea. The distillery was founded by Eigashima Shuzo in 1888 to produce sake. Eigashima Shuzo obtained a license to manufacture whisky in 1919, but it was when the company moved to their current facilities in 1984 that White Oak Distillery was born. White Oak’s whisky stills are only in operation for one month every year and so their production is very small. Most of it's blended whisky, but when the single malts do come on the market the whisky is named ‘Akashi’ after its hometown. The first Akashi release was in 2007. This 'No Age Statement' bottling is a new product for White Oak, released in September 2012. It's a blend of 7 YO, 5 YO & 4 YO malts from 3 types of cask. The intention is for this to become the distillery's 'house' expression. This release is limited to 4500 bottles. Non chill filtered and no colouring added. 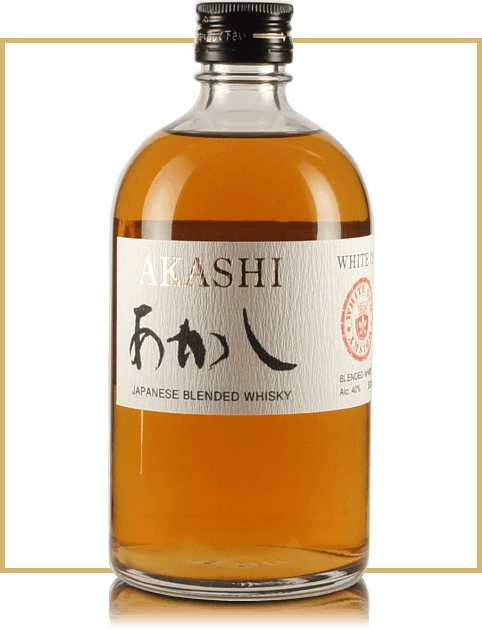 The White Oak Akashi is a promising Japanese blend equipped with a suprisingly powerful aroma and a slightly different aqueous structure. Nose Powerful, fruity with apple aroma, sweet malt and honey, chamomile, floral, turf and rubber. Palate Soft, sweet, fine apple flavoring, malt and peat, light, young, raw and crunchy. Finish Short, sweet and slightly fruity with peat.